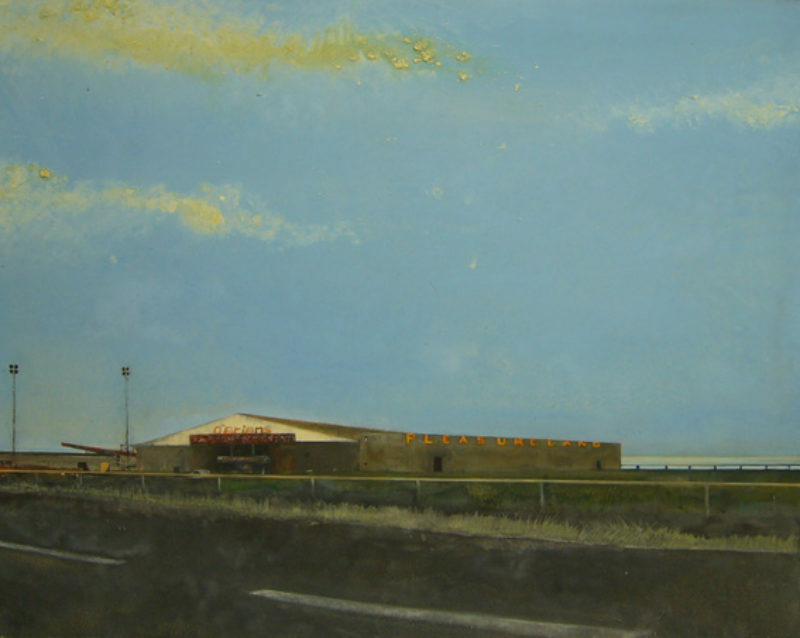 Jock McFadyen’s distinctive work is often described as raw or gritty. This is not solely due to his favoured social realist subject-matter, but also because his painting always pushes against the grain of conventional taste. Never predictable, he sets own agenda, a fact which invariably puts his work at odds with critical fads. For instance, at the Chelsea Art School in the early 1970s, where he studied as a mature student, he was still at the centre of the British pop art movement, its teaching staff including archetypical practitioners of that glam mock time such as Allen Jones. The independent McFadyen however, developed his own approach to socio-political themes that had more to do with the visceral outsider art of the austere 50s beats, than the anodyne pop music of the swinging 60s Beatles. His earlier work, with its searing images of urban decay and psychotic horrors, has a truly Ginsbergian ‘Howl’ in aggressively collaged studies that McFadyen describes as ‘a kind of hybrid between drama and documentary’. Such fractured and distorted images of the physical and social malformed and dysfunctional not only disturbs the eye, but profoundly disorientates our cultivated and conditioned sensibilities. With such nightmare images McFadyen grants us a frightening glimpse into our hidden, but ever present, terrors of the modern urban nightmare where shadowy figures emerge to take on uncertain shapes and forms that grotesquely hover between man and beast. Strangely, in a particularly uncanny fashion, a similar, if much less intense, experience is created by McFadyen’s paintings in his recent show, Pictures of Scotland —yet, on this occasion, for different reasons. With an Edinburgh Festival exhibition carrying such a clichéd title the unwary might have been lead to expect the predictable effect—a rich stew of Landseer-type romantic landscapes mixed with a golden steamy glow of kitsch highlandism. Instead however, the viewer of this exhibition, as always with McFadyen, is treated to an unsettling aesthetic assault, in which pared down, bleak, unrelenting panoramic views of non-picturesque Scotland are suspended against the crumbling brickwork of a disused warehouse which acts as an unlikely art venue. This unexpected combination of painting and derelict display space works extremely beautifully, but success cannot be put down to mere good fortune, especially when it is remembered that McFadyen has also been involved with very successful stage designs, most memorably for a major ballet production of The Judas Tree at Covent Garden in 1991. Thus paintings and venue setting strangely compliment, but, simultaneously contrast, with each other in a powerful dramatic manner. Within the paintings themselves that contradictory process is further continued as subtly suggested narrative figuration and compositional abstraction uneasily merge into hauntingly lyrical images of an elusive country and its ghostly people who appear to be just beyond the pale.